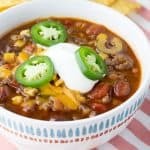 It's like tacos and soup had a baby - with the texture of chili. Using sauté setting on Instant Pot - add ground beef and onions to pressure cooker. Season with pepper and cook until beef is thoroughly browned - mixing frequently. Pour into colander to drain and return to pot. Add all remaining ingredients and mix well. Switch to manual setting for 12 minutes and close lid. Once cook time is complete - quick-release pressure. Serve with tortilla chips, shredded cheddar cheese, sour cream, and jalapeños.